I was horrified to learn that an oil tanker burst into flames in the BOD’s petrol pump in Samdrup Jongkhar. (Read Bhutan Observer article) The fire was quickly contained, but only after two men had been seriously injured. We’re lucky that the fire didn’t spread to and cause unimaginable damage to the residents of Samdrup Jongkhar. 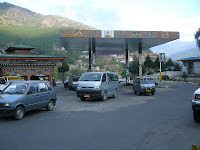 The BOD station in Thimphu is a disaster waiting to happen any day. The street literally runs through the middle of the petrol pump. So traffic is heavy. But not just to fuel-up. Every driver uses the BOD station as a thoroughfare. The danger is obvious. If something like the Samdrup Jongkhar incident were to take place in Thimphu, it would be difficult to control the fire. It would be catastrophic. One, the station stores much more fuel. And two, the resulting traffic jam would prevent fire trucks from reaching anywhere near the inferno. The solution is also obvious. Redesign our streets. Or, if that’s not possible, relocate the BOD.